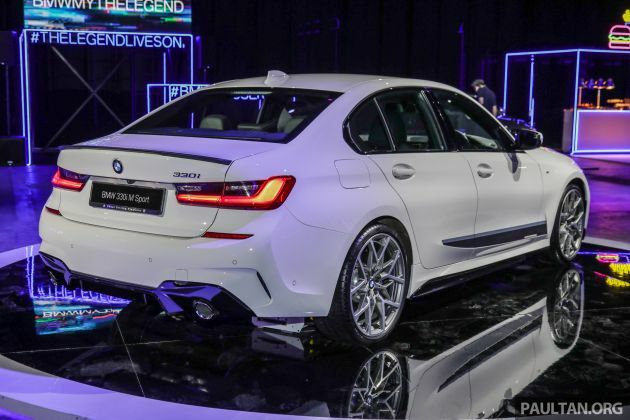 Alongside the standard G20 BMW 3 Series, BMW Group Malaysia also had a range of M Performance parts on display at the launch of the seventh-generation sports sedan. This Alpine White show car was fitted with a bunch of look-faster components raided from Munich’s latest catalogue. At the front, you’ll find a gloss black grille instead of the standard chrome item, which goes some way towards disguising the size of the massive double kidneys. You’ll also find a front splitter extension and deeper side skirts, both of which are dressed in gloss black and accentuate the already sporty design of this 330i M Sport. Moving to the rear, there’s a small bootlid lip spoiler and a larger diffuser insert with more pronounced fins. This car also comes with matte grey stripes along the sides of the car – complete with the M Performance script – as well as intricate 20-inch Style 795 M forged alloy wheels in a two-tone finish. As yet, the company has not released any pricing for these components; we will update this article when we get it. Those interested will have to contact their local dealer for details, but suffice to say these accessories will not come cheap – especially those humongous wheels. The G20 BMW 3 Series was launched today in a single 330i M Sport variant, priced at RM328,800 on-the-road without insurance. It is powered by a revised version of BMW’s B48 2.0 litre turbocharged four-cylinder engine, sending 258 hp and 400 Nm of torque to the rear wheels via an eight-speed automatic transmission. The post G20 BMW 3 Series – M Performance parts on show appeared first on Paul Tan's Automotive News. 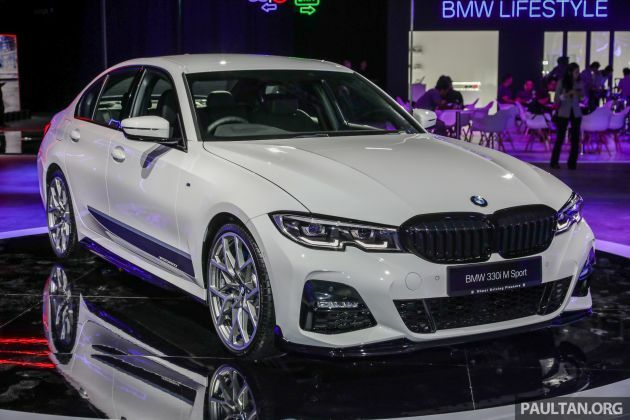 0 Response to "G20 BMW 3 Series – M Performance parts on show"